Playing live dealer casino games on the go is becoming increasingly popular. For one, mobile devices are more wide-spread than PCs and, more or less, accessible at all times. There are two ways one can play when on the move – either via browser-based apps which operate online, or native apps available for download. The first require nothing else than a game developed in HTML5, which instantly makes it mobile compatible for a range of different devices. Software runs via the Internet and games can be launched on mobile casino sites accessible via a number of different browsers, such as Google Chrome and Safari. Native apps, on the other hand, are designed to operate on specific tablets and smartphones. They’re available for download via app stores linked to specific operating systems, such as Apple’s App Store for iOS, Google Play for Android, etc. When it comes to real money gambling apps, Apple has a pretty strict policy applicable to those offered via iTunes, while Google Play doesn’t allow real money casino games at all, which is why online casinos are developing native Android apps downloadable directly from their websites. Each of the two options has its own advantages. Web-based games will not weigh down your smartphone’s memory, but on the other hand, you’re likely to experience unsatisfactory sharpness of the visuals and simplified sound effects. Downloading an application on a mobile device makes the game run with full media support and allows it to deliver the same quality of visual and audio effects as when playing on a PC. What’s more, adding the app icon to your home screen makes it accessible with a single click. Last but not least, tailored mobile apps are faster and they’ll fit your particular device better, allowing for an easier and more convenient way to navigate and play. Having said that, be aware that not all native apps are created equal. We’ve analysed a good many of those which are currently available so that we could recommend the very best the market has to offer. BGO Casino provides an outstanding mobile app which features an interface designed with mobile player in mind. It can be downloaded for free via iTunes on iPhone, iPad or iPod Touch operating on iOS 8.3 or a later version. When you open the app the very first time, it will need to check your location for legal reasons. If you’ve already got an account with BGO Casino, simply enter your username and password to login. New players can register directly through the app and claim the operator’s welcome bonus. Game catalogue is not as large as in desktop version, but you’ll still find a selection of about 30 Playtech-powered live dealer games. Take your pick between European, French, Speed, Prestige and Age of the Gods Roulette, an array of Blackjack variants among which Unlimited Blackjack and VIP tables, standard and Mini Baccarat games, and Hi-Lo. Suffice to say that Mr. Green’s Casino & Sportsbook App has been voted 2016 Casino App of the year by the International Gaming Awards. It’s available for download on both iOS and Android devices, features beautiful design and user-friendly interface, allows for fast and secure deposits, and offers access to 24/7 live support. You’ll also find convenient search function and exclusive App-only offers. Users of iPhones and iPads have the opportunity to quickly log in using Apple’s Touch ID. Android users will not find the application in the App store itself, but should instead go to the Casino website and download it from there. They’ll need to adjust their security settings to allow for download from “unknown sources”. Mr. Green native app offers over 50 live dealer games, including the operator’s exclusive tables and Salon Prive. You’ll find a whole assortment of Evolution Gaming products, among which European, American, Immersive, London, Dragonara and Lightning Roulette, Speed Baccarat, Live Casino Hold’em and Caribbean Stud, and Dream Catcher. NetEnt contributes with their Live Roulette and Blackjack variants, and Authentic Gaming provides Roulette games streamed from land-based casinos in Georgia and St. Vincent, Italy. Extreme’s portfolio is represented by Live Blackjack and Baccarat, plus a range of Roulette variants such as Golden Ball, Club and Speed Roulette, Lucky Ball, Reel King, Dolphin’s Pearl, Lucky Lady’s, and Sizzling Hot Roulette. Among many industry awards claimed thus far, Leo Vegas boasts the title of the winner of “Best Native App” at the EGR Marketing and Innovation Awards 2017. The Casino’s iOS app, compatible with iPhone, iPad and iPod touch, is available via iTunes and requires iOS 8.0 or later. Although you won’t find their Android app in Google Play Store, it doesn’t mean it’s not available. All you need to do is permit access to applications outside of the Play Store, and then enter android.leovegas.com into your mobile browser. Download process will begin automatically. Roulette fans face an incredible choice of 50 game variants, among which those powered by Authentic Gaming and streamed from land-based casinos around the world, Evolution’s native games such as Svensk, Deutsches and London Roulette, NetEnt’s Rocket Roulette, Extreme’s Golden Ball, Reel King, and Sizzling Hot Roulette. Equally large Live Blackjack collection features Celebrity Blackjack Party, Leo Vegas Sports Blackjack, and multiple versions of the classic game variant provided by Evolution Gaming, Lucky Streak, Extreme Live Gaming, NetEnt and Ezugi. The list further includes more than a dozen card games such as Speed and Squeeze Baccarat, Three Card and Texas Hold’em Bonus Poker, and Live Dragon Tiger. Exclusive Leo Vegas tables and those offered to VIPs are also part of the package. William Hill Casino offers the owners of Apple devices to download a dedicated iOS app for iPhone and iPads (iOS 9.0+). Playing on an iPhone will allow them to enable Auto-Login option which will make it unnecessary to input username and password each time they launch the app, or alternatively use Touch ID if their device supports it. William Hill did introduce an Android app as well, though it’s currently available only in the UK (Android version 5.0+). Residents of other countries can play live dealer games by launching William Hill mobile site in their preferred browser. The Casino’s native app is visually attractive, with a smooth interface similar to the one used on the website. Collapsible menu offers access to games, promotions, and a help section with an FAQ list and contact options. Select Live Casino tab and you’ll be offered to pick among a dozen or so European and French Roulette variants, a similar number of standard 7-seat and Unlimited Blackjack games with low, medium and high limits, Casino Hold’em, and several Live Baccarat variants. As long as you have a compatible mobile device and an active internet connection, you can enjoy Royal Panda’s live dealer offering on the move. An iPhone, Android phone, iPad, Samsung Galaxy or similar smartphone or tablet will give you online access to about 15 Evolution-powered games. Simply visit www.royalpanda.com or scan the QR code supplied on the operator’s website. You’ll find all buttons except for the one used for logging in at the bottom of your screen. Click on Menu to access the cashier, check out active promotions, learn about the Casino and available payment methods, or scroll down to find Live Casino section. On top of exclusive Live Roulette and Blackjack tables, you’ll be offered European, Immersive, Speed, London and Slingshot Auto Roulette, classic Live Blackjack variant, standard and Speed Baccarat, Live Caribbean Stud and Ultimate Texas Hold’em Poker, as well as Live Dream Catcher. High-rollers can take a seat at one of provided VIP tables. 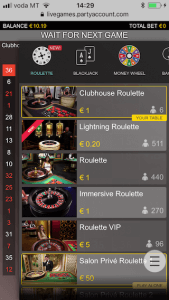 Betfair Live Casino features downloadable apps for both iOS and Android devices, the first offered via iTunes, and the latter accessible via a link provided on the operator’s website. If you own an Android smartphone or tablet, don’t forget to adjust your security settings prior to downloading. Once you launch the app, the menu on top will allow you to choose your preferred game category, while the one on the bottom offers access to promotional offering and the cashier. This elegant Live Casino is home to a diverse range of Playtech live dealer games. Roulette fans get to play European and French Roulette, Prestige, Speed, and Age of the Gods Roulette. There are more than a few Live Blackjack tables with different limits, including Unlimited Blackjack, as well as Live Baccarat and Live Hi-Lo.